The Lorenz Classico Watch Series Start from only £260. been producing high quality watches since the early 30’s and we are proud to be able to offer their fine watches on our site. Purchasing one of their fine time pieces is a sound investment as these watches are built to last based on Swiss mechanical technology. Lorenz was founded in 1934 in Milan, Italy by time piece enthusiast Tullio Bolletta. Tullio never gave up in his quest for designing and producing watches. In 1960, Lorenz was awarded the highest award in the sector, the Compasso d’Oro. This award was given for Lorenz’s designer Richard Sapper and his work with the Stable Table clock. Lorenz continues to be a perfect marriage between renowned Italian style and robust Swiss engineering. Built from high quality stainless steel the Classico Divers series provide a good balance of style and functionality. Available for both men and women, this range of chunky watches are bound to impress. 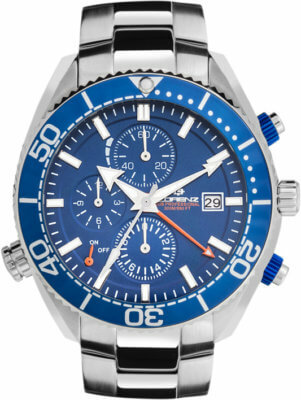 If you are after a modern sporty looking dive watch then the Sportivo Series may be the one for you. This smart divers watch will look good as a dress watch as much as a divers watch! If you need any information or help with purchasing one of these fine watches from Lorenz, please get in touch and a member of our sales team will be happy to help. This entry was posted in Brands, Guides. Bookmark the permalink. Doubleo Watches are committed to bringing you the best and most up to date information on watch brands and their ranges.